India (2): economical with comfort - Salut! When I saw in the Times of India that Sir Richard Branson wanted to branch out into the domestic flights market in India, the appropriate response seemed to be one of sympathy for future inter-city passengers in the sub-continent. Having just endured Virgin Atlantic from Heathrow to New Delhi, I could imagine little worse than having to continue my journey on another Virgin aircraft. My first Virgin knees-up was in 1986. Plain Richard Branson, as he then was, invited a crowd of thirsty freeloaders to knock back champagne on the inaugural flight of his London-Miami service. It was a jolly affair and our host was, if I recall the event correctly, dressed up as Robin Hood to emphasise that he was the good guy robbing from the rich carriers to open up the skies to poorer travellers. Some bright spark in Virgin PR had even taken the trouble to bring along a few Page Three girls whose sole function was evidently to be photographed cavorting with Branson in the hotel swimming pool, thus ensuring tabloid inches for the new route. I have no memory of spending the flight with my knees pressed so hard into the seat in front of me that I felt like a battery hen crammed into a crowded cage by an unscrupulous poultry producer. That sort of knees-up was a treat I had to wait 21 years to experience. It is easy to forget that while Sir Richard may have a youthful outlook and appearance, and generally seems to be on our side , he did not get rich by worrying too much about comfort in economy class. But I can honestly say that despite bleak experience of certain African and Pakistani airlines, I have never made a more uncomfortable long-haul air journey. My part in the Miami service launch obviously did not make me one of Sir Richard's bosom buddies. We occasionally met again at press conferences or around courtrooms where he was locked in battle with BA, and even had a friendly exchange of messages after one of his ballooning exploits. That hardly amounts to a relationship warm enough to lead me to believe his people would actually be listening when I made a plaintive plea in Salut! to be looked after by Virgin during its leg of my air odyssey from Abu Dhabi to London to New Delhi. And I know you get more or less what you pay for in the air. I did, however, expect a lot more leg room than Sir Richard chose to give me. I also expected something better than the slow, in some cases surly service provided by his cabin crew. Was I just unlucky? Not if you look at the comments at Flickr by the passenger who took the picture illustrating the trailer for this posting. And not if you believe the Virgin hostess who told me: "No, your row is not narrower than the rest. 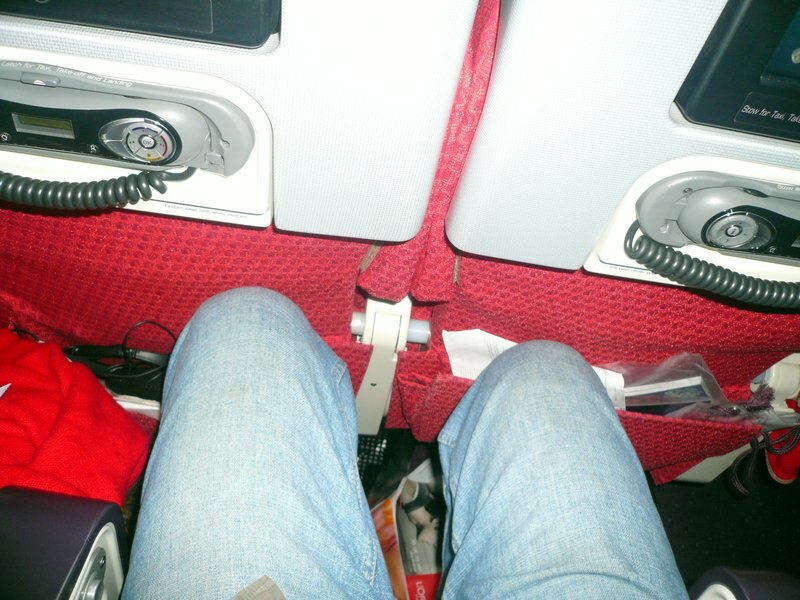 I am afraid the lack of leg room is a common complaint." Sir Richard is in many ways an admirable character. He has built a successful airline from nothing, just as he has prospered in a string of other commercial adventures since boyhood. His fondness for hot air balloons shows he is also no stranger to uncomfortable forms of transport. So I invite him to travel unannounced, economy class and in some other disguise - Robin Hood might be a little too obvious - on one of his own flights to India. And then come back, as I did from Nepal, with an airline such as Qatar. Salut! will be delighted to publish his compare-and-contrast impressions of the two journeys.